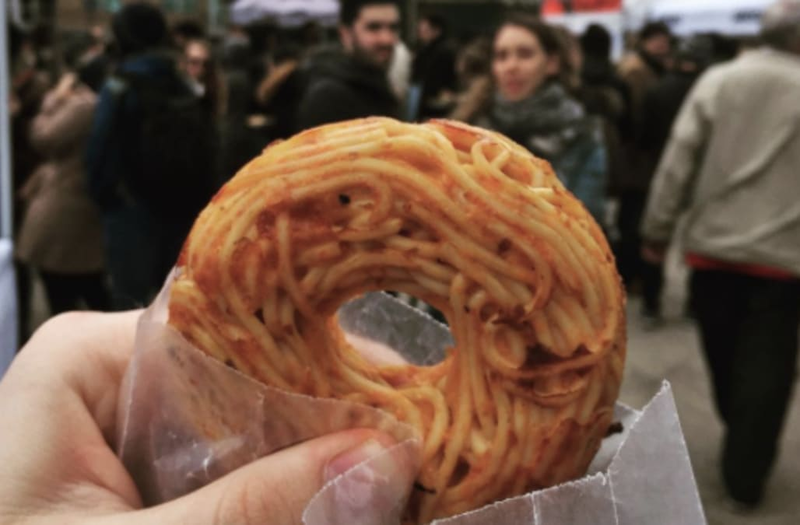 Carb lovers, rejoice, because spaghetti donuts are now a thing. The savory creation comes at a time when chefs and foodies are cooking up the most insane hybrids, with our favorites being sushi donuts and avocado buns. Of course, the donuts premiered at Brooklyn's popular food festival Smorgasburg, where the now-famous ramen burger debuted. Pop Pasta is responsible for the foodie mashup and features different flavors such as carbonara, red and Bolognese donuts. According to Today, the donut is made by mixing spaghetti and sauce into donut molds. Then, the pasta is baked to crispy perfection. Basically, Today called the hybrid a spaghetti pie. We can't wait to take a bite of this wild noodle trend.